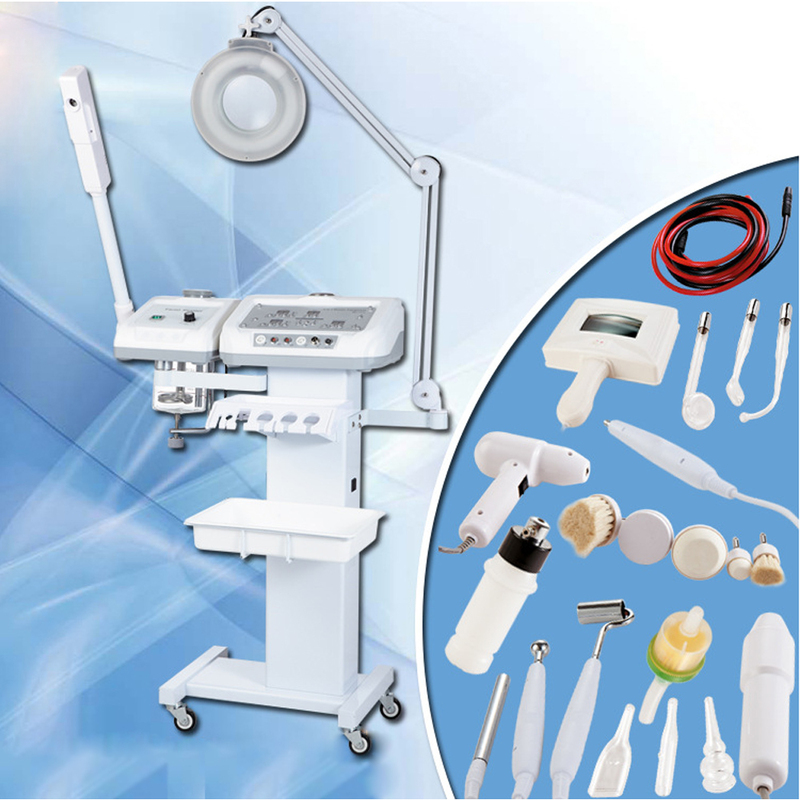 SR-RU1319A, a 10 in 1 multifunctional beauty equipment, includes most of common and necessary function. And it is widely used. Especially in the Beauty Salon. It has wheels at the bottom so that it could be easily moved. And there is a tray used for placing the accessories. Each function has a separated switch. Easy and simple to handle and overcome the defect of traditional multifunctional instrument that with one function break down, all the others could not be used. This instrument is with generous, elegant and futuramic design. The panel’s color is pastel. It has fully reflected utility value of this instrument. Generate steam to moisten the skin, soften the epidermis, clean the dirt and dead skin cells. By the action of ozone light, the instrument could generate sterilized and antiphlogistic steam. Eliminate the dead cell and the dirt in the pore, refresh the skin. Different brushes to fit different part. It can remove the dirt deep into the pore to purify and shrink pores,and get rid of dead cells. Accelerate the blood circulation and lymphocinesia, facilitate the cells metabolism. Supply the epidermis with nutrition and eliminate the harmful impurity. Improve the skin immunity. Convert the toning lotion, anti-inflammatory lotion or shrinkage water into steam and spray. Remove all kinds of spot such as freckle, senile plaque, tattoo etc. No scar, no bleeding. Help to observe and analyze the skin. Make it easier and faster to find the blackhead and acne. - The lens head can rotates left and right with 360 degrees and flips up and down 180 degrees. - Power on and off switch. - Hydraulic look, no visible springs. - It is a small rectangular box shaped lamp. - The Wood's lamp can help to analyze differernt skin conditions: Thick skin , Thin Skin, skin cutin layer and dead cells; Normal and healthy skin, Oily areas of the face, and Sun damage, pigmentation and future age spots. - Enlarged and clogged pores.